Estimated payment based on 8.25% APR for 84 months for well qualified buyers. Terms may vary. Hi, I am interested in your 1977 Ford Thunderbird (stock #CJNT050) listed on Autotrader for $13,900. I'd like to get more information about this vehicle and confirm its availability. 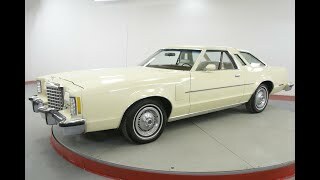 Worldwide Vintage Autos is pleased to present this time capsule 1977 Ford Thunderbird! Ford Thunderbird (colloquially called the T-Bird) is a nameplate that was used by Ford from model years 1955 to 1997 and 2002 to 2005 over eleven model generations. Introduced as a two-seat convertible, the Thunderbird was produced in a number of body configurations through its production life, including four-seat hardtop coupe, four-seat convertible, five-seat convertible and hardtop, four-door pillared hardtop sedan, six-passenger hardtop coupe, and five passenger pillared coupe, with the final generation produced as a two-seat convertible. Please refer to the 28 point inspection report located in the photos above. For more details on any disclosure items please see contact a sales agent today at 1-877-422-1570. The cost of parts and restoration of these vehicles are increasing daily. They are not making any more and, therefore, they are becoming more rare by the day. Buy one complete and ensure your investment for the future. An excellent investment and something you can enjoy daily. Collectible vintage vehicles have historically appreciated at a rate greater than that stock market, gold and other arts and collectibles as documented by many articles and auction result tracking. NEED MORE DETAILED INFORMATION? CALL US AND WE WILL HELP ANY WAY POSSIBLE! Please mention you are working with Worldwide Vintage Autos in order to expedite the process. For financing, Down Payment required by lending institution will be due within 72 hours of deposit in addtion to deposit. Down Payment is refundable. Deposits to hold vehicles is $500. Upon payment of the $500 deposit, the vehicle will be held for 72 hours pending final payment. Deposits are non-refundable due to i). the vehicles are taken off the market and we turn down other buyers during the 72 hour period and ii). there is significant re-marketing costs associated with relisting / remarketing our vehicles. Inspections should be performed prior to putting a deposit down on a vehicle. We encourage inspections. We disclose known defects and imperfections but we are not you. Purchasing a vehicle is very subjective. Come visit our showroom in Denver, CO, we would love to meet you in person! We require inspections to be done prior to putting down a deposit. We recommend having our shipping coordinator facilitate the transport of your new vehicle. We can handle all shipping arrangements in-house, so you know where your vehicle is from point A to point B . We highly suggest using only enclosed shipping to protect your investment. We use Central Dispatch and they ensure all carriers are licensed, insured and bonded. 1. Vintage trucks and 4x4 s! Pinzgauer, Unimog, Defender, Bronco, Land Cruiser FJ40 FJ45 FJ55, International Scout, Jeep Willys, Dodge Power Wagon, Nissan Patrol, Ford Truck 4x4s, Chevy Truck 4x4s, NAPCO, Marmon Herrington, etc.